A coating is a covering that is applied to the surface of an object, usually referred to as the substrate. The purpose of applying it may be decorative, functional, or both. The coatings itself may be an all-over, completely covering the substrate, or it may only cover parts of the substrate. 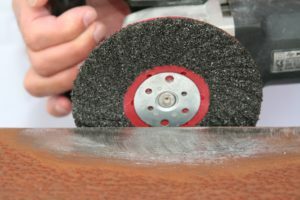 KGS Semi Flexible Black Silicon Carbide (type C) discs are perfect for fast and quick removal of coatings, glues, mastic, epoxy, adhesives, urethane, rubberized coatings and sealers.